I can't believe that our winter stay in Destin is ending! We just got here. One of the problems with getting older is that everything moves so much faster. 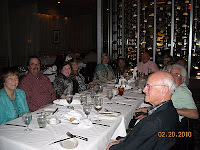 Saturday night we went to Ruth's Chris Steakhouse to hear Michael who is one of the best horn men on the planet and to have lots of fun! At least the weather has been fabulous and has provided much time to walk on the beach. Saturday was so beautiful that we just sat on the beach after our walk and talked to each other and to everyone that meandered by...we have some great friends here. I'm now writing for Demand Studios who provide content for a variety of web sites. Whenever I have an hour or two, I can go online and claim a topic, write it, submit it and then they put money in my PayPal account! Since I still can't write dialog, at least I'm getting paid for writing original content! I'll let you know how it goes. I'm also watching entirely too much Olympics and NASCAR!! Gotta go watch! Just a few pictures of our wonderful weekend at Daytona! The Saturday Nationwide Race was great...Tony Stewart won and Danica and Junior did ok until someone wrecked each of them. The 88 car is Junior's and the 14 is Tony! We had fan zone passes that got us right on the track before both of the races...Saturday, and of course, the Daytona 500 on Sunday. The Sunday race was a pain because of track problems. Hours of delay! You would think that if you were having the "Super Bowl" of racing, you'd check the track DAILY...obviously, they didn't, leading to a pot hole that had to be fixed mid race. 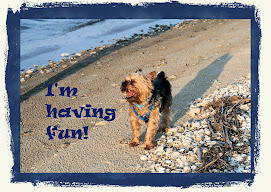 We've had fun too in Saint Augustine. Drank tons of water from the Fountain of Youth and bought 10 bottles to bring home! Ate dinner at Harry's which is the best meal we've had in a while. Also checked out the Oasis and Conch House restaurants. All the meals were great! We're at the KOA in Saint Augustine Beach and it's been superb. Highly recommend it. Great location. We spent all day in Old Town Saint Augustine which was wonderful. Bought some fun things...and Cindy's birthday present! We'll head back to Destin in the morning. And then, try to figure out when we can head back to Nashville so we don't get caught in snow.